"A few years ago [in 2000], a family from Lemessos, Cyprus, named Vassiliou received the following miracle. In Greece they are well known from the televised requests they made in order to find a donor for their young boy Andrea, who suffered from leukemia. The donor was indeed found and the parents began preparing for their trip to Texas, U.S.A where the bone marrow transplant was going to be performed. Meanwhile, they also prayed and begged Jesus Christ to save their boy. Before they left for the U.S.A the parents heard of St. Marina's miracles and they called the monastery of St. Marina located on the island of Andros in Greece to ask for her blessing. The Elder of the monastery, Archimandrite Fr. Cyprianos promised that he would pray to St. Marina. He also wished the parents for St. Marina to be with Andrea in the operating room, to help him. With Elder Cyprianos' blessing and with strong faith that St. Marina would help indeed, the Vassiliou family went to the U.S.A.
After the necessary pre-operation tests that Andrea had to undergo, he was taken to the operating room. A short time before the operation was to begin, a woman came to see the surgeon who would be operating on Andrea. She said that she was Andrea's doctor and asked to be allowed to observe the operation. The conversation that ensued proved that the woman was indeed a doctor. However, the surgeon replied that 'outside' doctors were not permitted to be present in the operating room and that his medical teams' policy was that no doctor other than those on the team be involved in such delicate operations. The persistence of the woman however, convinced the surgeon to allow her in the operating room. But before, he asked her to leave her coordinates [credentials] at the administration desk. The unknown doctor did as told and then entered the operating room with the surgeon. During the operation, she gave several directions regarding the progress of the procedure. The operation went well and in the end the surgeon thanked the woman and exited the operating room. Andrea's parents immediately went to inquire about the outcome of the surgery and the surgeon replied that all had gone very well, adding that he could not understand why they had brought Andrea to him when they had such a fine doctor. The parents were surprised and responded that they had not brought any doctor with them. The surgeon insisted, however. He also told them that when he came out of the operating room Andrea's doctor had remained there for a little longer with the rest of the operating team and therefore, she would probably still be around. He recommended that they look for her. The search, however, proved pointless, as the 'woman doctor' was nowhere around. The Vassiliou couple then concluded that it must have been a doctor from Greece or Cyprus who had decided to travel to the U.S.A and contribute to the delicate operation. They expressed the wish to know who she was so that they may be able to thank her, and at the surgeon's recommendation they then went to the administration desk to ask for her coordinates. It was with utter surprise that they read that the unknown woman had signed with the name "Marina from Andros". Tears of gratefulness and joy filled their eyes as they recalled that the Elder at the monastery had said to them that he wished Andrea to have St. Marina in the operating room to help him. Andrea's parents shared with the media their joy both for the successful operation and Andrea's recovered health and for the miracle they received. 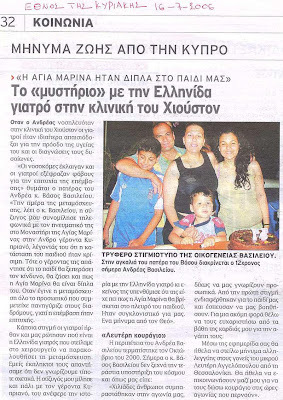 The Vassiliou family made the vow that the entire family will be present at the saint's monastery every year on the saint's feast day (July 17) and Elder Cyprianos reports that the family has been making the annual trip from Lemessos to Andros every summer to thank Saint Marina for saving Andrea. 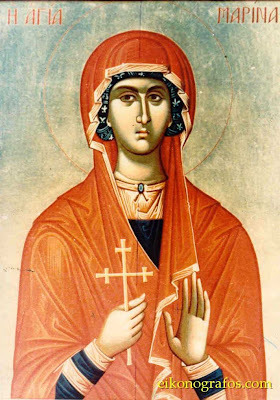 "The Holy Great Martyr Marina was born in Asia Minor, in the city of Antioch of Pisidia (southern Asia Minor), into the family of a pagan priest. In infancy she lost her mother, and her father gave her into the care of a nursemaid, who raised Marina in the Orthodox Faith. Upon learning that his daughter had become a Christian, the father angrily disowned her. 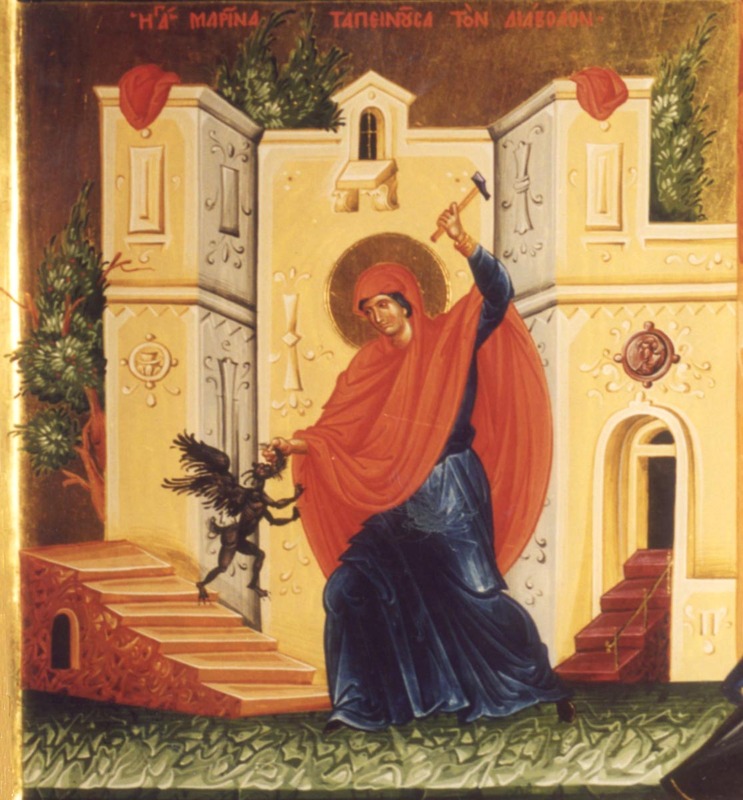 During the time of the persecution against Christians under the emperor Diocletian (284-305), when she was fifteen years old, St Marina was arrested and locked up in prison. With firm trust in the will of God and His help, the young prisoner prepared for her impending fate. The governor Olymbrios, charmed with the beautiful girl, tried to persuade her to renounce the Christian Faith and become his wife. But the saint, unswayed, refused his offers. [When Marina rejected that he ordered her to bow down before the idols and to that St. Marina replied: "I will not bow down nor offer sacrifice to the breathless and dead idols who do not recognize themselves nor do they know that we honor or dishonor them. I will not give them that honor which belongs only to my Creator."] The vexed governor gave the holy martyr over to torture. Having beaten her fiercely, they fastened the saint with nails to a board and tore at her body with tridents. The governor himself, unable to bear the horror of these tortures, hid his face in his hands. But the holy martyr remained unyielding. They stripped her and tied her to a tree, then burned the martyr with fire. 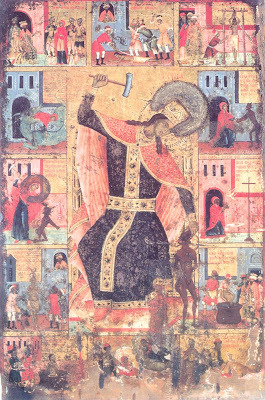 Barely alive, the martyr prayed: "Lord, You have granted me to go through fire for Your Name, grant me also to go through the water of holy Baptism." Hearing the word "water", the governor gave orders to drown the saint in a large cauldron. The martyr besought the Lord that this manner of execution should become for her holy Baptism. When they plunged her into the water, there suddenly shone a light, and a snow-white dove came down from Heaven, bearing in its beak a golden crown. The fetters put upon St Marina came apart by themselves. The martyr stood up in the fount of Baptism glorifying the Holy Trinity, Father, Son, and Holy Spirit. St Marina emerged from the fount completely healed, without any trace of burns. Amazed at this miracle, the people glorified the True God, and many came to believe. This brought the governor into a rage, and he gave orders to kill anyone who might confess the Name of Christ. 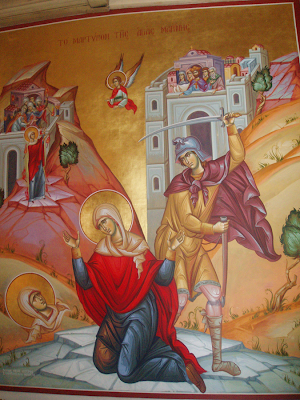 15,000 Christians perished there, and the holy Martyr Marina was beheaded. The sufferings of the Great Martyr Marina were described by an eyewitness of the event, named Theotimos. Up until the taking of Constantinople by Western crusaders in the year 1204, the relics of the Great Martyr Marina were in the Panteponteia monastery. According to other sources, they were located in Antioch until the year 908 and from there transferred to Italy. Now they are in Athens, in a church dedicated to the holy Virgin Martyr. Her venerable hand was transferred to Mount Athos, to the Vatopedi monastery." May Christ our God have mercy on us and save us, through the intercessions of the Holy Theotokos, Saint Marina the Great-martyr, and all the saints! Amen! The Loving Saint Marina other Hand is keeped in tha Holy Monastry Saint Marina Sofico in Corinthos greece there has been thousands of miricals. one which happened to me in 2006 after my mother past away my father took four out of five sibiling to greece. there in the Saint Marina monastry my father has four sisters,that have been nuns from when the monastry was first built my the previous Abbes Vikendia was my elders auntie since then to have past away. The night of the comemerating servise on the Saint feast nigt I was in church praying that when we go back to Australia that the Monastry would be finacial taken care off.During the servise I feel usleep for a few minutes and I saw a young beautiful young girl with a mole on her left of her face with black lushes thick hair in a plat. she coming past me smiling I then suddenly wakend up, and went to recevie Holy communion. 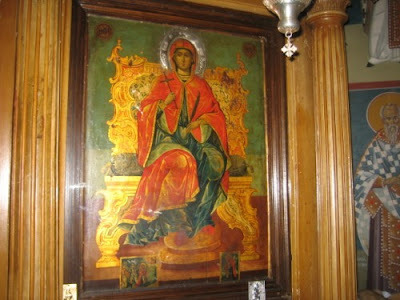 When the service finished I looked closley at the large icon that was in the church it was Saint Marina that I saw. The mole on her face but I saw her as flesh not as a painting So bautifly and gracefule. My Antie Paxoumia the Nun also gave me the opotunity to venerate Saint Marinas Hand . Thank you Saint Marina For you gift please pray to our loving GOD that he keeps my family and generations to come in peace, safe and takes a hold of them enlightens them streagnthen them giving them the love and jeal for Gods Good thing and all the Saint Such as Saint Necktarios, Saint John Maxamovic, Saint Nicolas, Saint Xenia. May God and the Loving Blessed Mary Mother of God Keep us all Safe and give us indurance. Read the pray every day, The Akathist Pray to the Mother of God, and you to will recive her grace and your family. you can google the pray. Pray for us Saint Marina .. she did a miracle with my aunt .. my aunt didn't have children for 15 years and she knew about St Marina that she perform miracles with women how don't have children .. and my aunt prayed to God to give her children for the supplication of saint Marina .. and God gave mt aunt little Marina and two years after that he gave her Monica .. may God protect us for her prayers ..
Pray for us oh saint of God.